When it comes to protecting people and property from rising sea levels and catastrophic storms, it turns out that Mother Nature can often provide a better solution than an expensive engineering project. KQED's Stephanie Martin spoke with Stanford ecologist Katie Arkema, who published a national map today showing where coastal reefs and wetlands are keeping communities safe, and which areas may need more preservation. Ms. Arkema, you're describing this map as a first-of-its-kind. What does it show that we haven't seen before? It shows where coastal ecosystems can play an important role in helping to protect people and property from coastal hazards. It does this by looking not only at where do ecosystems like wetlands and dunes reduce risk to sea level rise and storms, but also by overlaying this with information on populations living along the coastline and residential property value data that we got through a relationship with Zillow. So what's an example of a place here in the Bay Area where people and property have some good natural protection already? There are a number of good spots that provide protection. One example would be around Stinson Beach where there's high dunes along the shoreline in front of coastal properties. Another example would be in Corte Madera where there's wetlands that can help to reduce storm waves and erosion. When your study looked at coastal geography you also took into account vulnerable populations, such as areas where there were more elderly or low-income people and that's part of how you assessed which areas are most at risk. What's an example of this in Northern California? We looked around the Bay Area, and we saw that there were places around Richmond and around Vallejo, for example, in the northern part and eastern part of the Bay where there are disadvantaged populations living along the coastline, but also in some cases where there are coastal ecosystems intact. 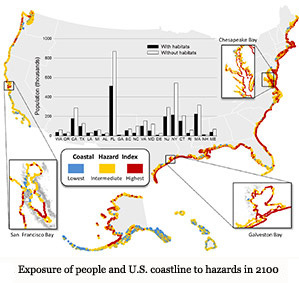 So these places are showing up as being more at-risk due to low elevation, for example, or softer shoreline types like mudflat areas or sandy beaches, but they also have some coastal ecosystems intact. 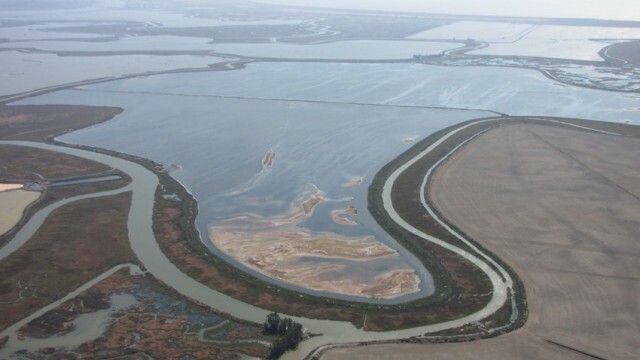 For example up near San Pablo Bay National Wildlife Refuge, there's an extensive wetland there which could help to provide protection from storms and sea level rise. How would you recommend restoring habitat or working with the natural coastline to better protect these vulnerable populations? There's a number of local efforts going on in the San Francisco area. For example the San Francisco Bay Conservation and Development Commission has led up a number of different projects identifying places that are at-risk and then using high resolution data and precise models, for example in the Marin County area, to look at the availability of habitats to attenuate waves. I would recommend that we leave space where possible for these ecosystems to accumulate sediments and to migrate inland as climate changes. What prompted you to conduct this analysis to begin with? This past year in the U.S. there was an effort to develop a National Climate Assessment, and I was part of a working group looking at the role of ecosystems in providing nature's benefits to humans and to the future. And there was very little information that linked coastal ecosystems and habitats with climate change scenarios, with hazards and with the distribution of people: vulnerable populations and poor families. So we realized there was a need, first on the national level, but then certainly and most importantly on regional and local levels to understand where dunes, oysteries, wetlands can play a role in our defense planning.